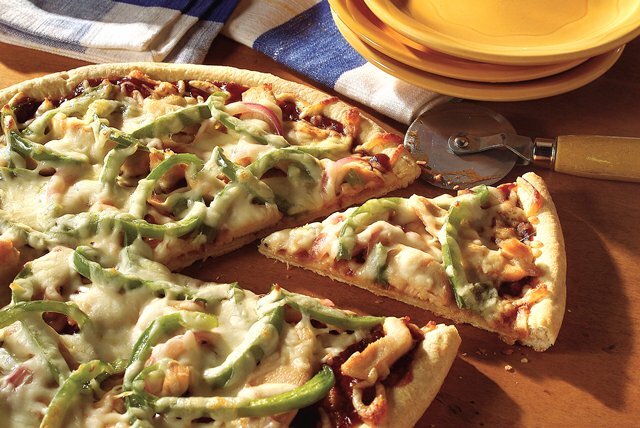 Enjoy the flavors of two favorites—BBQ chicken and pizza—all in one pie! Cook chicken and vegetables in large skillet sprayed with cooking spray on medium-high heat 4 to 5 min. or until chicken is no longer pink, stirring occasionally. Place crust on baking sheet; spread with barbecue sauce. Top with chicken mixture and cheese. Bake 15 to 18 min. or until cheese is melted and crust is golden brown. Prepare using KRAFT Original Barbecue Sauce. Sprinkle pizza with chopped fresh cilantro just before serving. Drizzle with 6 Tbsp. KRAFT Peppercorn Ranch Dressing just before serving.